Treatments are subject to undergoing a full consultation with a fully qualified therapist and are dependant on any contraindications identified. Results may vary. 3D-cryofreeze is a unique non-invasive treatment using a combination of electro and cryo therapy. Using the 3D-cryofreeze handpiece, this creates vacuum which draws the fat into the handpiece. This localised area within the handpiece is then frozen, causing 20% - 40% of the fat cells in that area to die. 3D-cryofreeze targets specifically the fat cells. By lowering the temperature to -6 degrees it pinpoints the content of the fat cells, causing them to crystalize. No other structures are affected by this process. The remaining content of the fat cells is then disposed of naturally through the body’s lymphatic system. This treatment is best for targeting those stubborn areas that just won’t shift. Typical areas ideal for 3D-cryofreeze including inner thighs, lower abdomen and ‘muffin tops’, however your therapist will provide a tailored treatment plan to provide you with the best possible results which may include combining 3D-cryofreeze with other technologies as part of a treatment program. Two areas can now be treated simultaneously with the 3D-cryofreeze duo application. On average you will see a 20% - 40% reduction of the fat in the localised area. As the body takes several months to flush out the dead fat cells, results will be visible after 6 - 12 weeks*. 3D-cryofreeze is a one off treatment, however it can be devised as a part of a course of treatments depending on your goals, your therapist will discuss this with you. It is great as a one off treatment for targeting stubborn areas, but can also be combined with other technologies on the machine to enhance results. For example if you have a pocket of stubborn fat but also loose skin on that area, it would be advised to combine 3D-cryofreeze with a course of radio frequency to both remove the fat and tighten/ tone the skin. First of all, an anti-freeze pad is placed onto the area of treatment, to protect the skin. 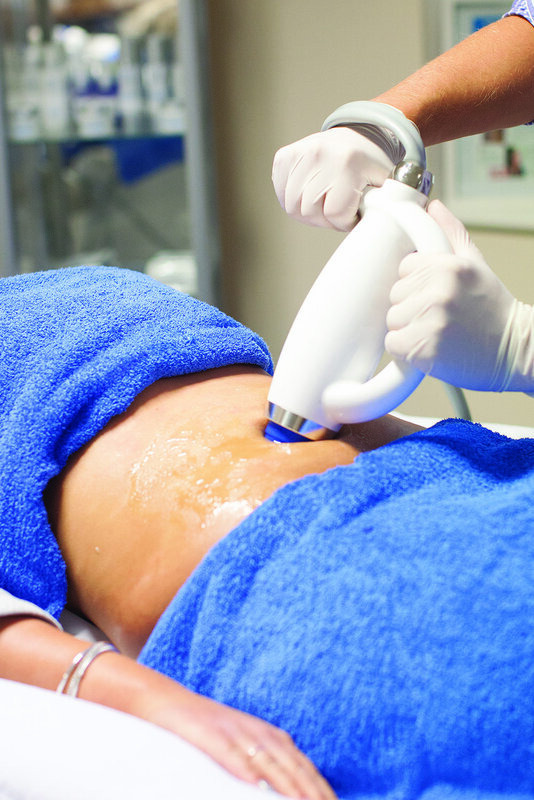 During treatment the fat is drawn into a suction cup before freezing. This will provide a slight pulling sensation and the area will be cold. Within a few minutes the area should go numb. The handpiece will be on the area from 30 - 60 minutes to depending on the size of the area being treated. 3D-cryo freeze is now available for the chin area! This applicator handpiece has been designed to target the dreaded ‘double chin’. Using the same technology as 3D-cryo freeze, this treatment targets specifically the fat cells. By lowering the temperature to -6 degrees it pinpoints the content of the fat cells, causing 20%- 40% of the fat cells in that area to die. No other structures are affected by this process. The remaining content of the fat cells is then disposed of naturally through the body’s lymphatic system. 3D-cavitation is best for treating larger areas of fat such as the abdomen, thighs and ‘muffin top’. Anti-ageing, skin tightening, smoothing of fine lines and wrinkles. A course of treatment is typically advised to achieve maximum results this is usually 6 - 8 treatments, one treatment per week for 6 - 8 weeks. 3D-RF Face & Body is a relaxing treatment. Glycerine will be applied to the skin, this acts as a conductor for the 3D-RF Face & Body energy. A small, round handpiece will be placed onto the skin and moved in gentle circular motions. A slight beeping noise will come from the machine, the handpiece will get warmer and warmer, building heat until it reaches 40 degrees. Your therapist will use an infrared thermometer to measure the heat of the skin. Once temperature has built up to 40 degrees, your therapist will continue to maintain the heat, continuing treatment on the area for 2 - 4 minutes, before moving onto the next area. With this nifty new handpiece we are now able to offer 3D-RF for the eye area! This treatment is fantastic for targeting those hard to reach areas such as crow’s feet and brow area giving your skin a tighter, smoother, more youthful appearance. This handpiece can also be used to treat the upper lip area, and those tricky areas around the nose. A typical treatment is 30 - 40 minutes and a course of 6 - 8 treatments is typically recommend to achieve maximum results. Non-surgical skin lifting has become one of the most sought after treatments and HIFU is the latest nonsurgical technology to excel in this area in just one single session! It targets individually brow lifting, jowl line lifting, nasolabial fold reduction, periorbital wrinkle reduction and overall skin tightening and rejuvenation. During treatment, the 3D-HIFU face handpiece is placed on the skin and held in one area at a time. You will experience a slight vibration and warmth whilst the energy is being penetrated. The handpiece will then be placed on the next area of treatment. This treatment may feel slightly uncomfortable around the jaw line but generally this treatment is pain free.treatment. Skin tightening, smoothing of fine lines and wrinkles, reducing the appearance of ncellulite. 3D-Body RF penetrates the skin layers to selectively heat the skin tissue and the extra cellular matrix where the collagen fibres are embedded. The local heating of the area being treated causes an immediate contraction of the collagen fibres, and at the same time increases the metabolism of the fibroblastin order to accelerate production of new collagen fibres and elastin fibres to create a smoother, healthier and younger looking skin. A course of treatment is typically 8 - 10 - individual 45 minute sessions. 3D-Body RF is a relaxing treatment. First of all, an ultrasound gel will be placed onto the skin, this acts as a conductor for the 3D-Body RF energy. A handpiece with metal probes will be placed onto the skin and moved in gentle circular motions around the skin. You will hear a slight beeping noise coming from the machine, the handpiece will get warmer and warmer, building heat until it reaches 40 degrees. Your therapist will use an infrared thermometer to measure the heat of the skin. Once temperature has built up to 40 degrees, your therapist will continue to maintain the heat, continuing treatment on the area for 2 - 4 minutes, before moving onto the next area. PPC is an advanced solution (derived from soybean) for the reduction of cellulite and excessive fat. The micronized active ingredient is penetrated into the skin and acts in the subcutaneous fat. It generates heat under the skin layer, increasing local metabolism. It also Increases excretion (sweating) and blood flow. These consecutive actions help to regulate the fat cells in the subcutaneous layer. When combined with professional treatment and following a healthy lifestyle results can be expected in 2 - 3 weeks. Applying the PPC to the fat will increase the temperature of the fat cell by 1 - 2 degrees. This will create a ‘melting’ within the fat cell and a cell stimulating effect in the area. The PPC cream and ampoules contains capsicum (chilli), this also increases the temperature within the skin to enhance this effect. This heat sensation will be generated within 5 - 10 minutes and last for approximately 30 minutes within the skin. To progress and enhance the results achieved from your professional treatment it is essential to continue the product application at home using our unique Rollerball Massage Applicator. Apply as directed by your clinic professional.